The homestead and cottage are completely set up for self-catering, however if you want a break from cooking during your time at Mataia then we have a variety of catering options available. Our food is simple but delicious home-cooking, utilising the best that the homestead gardens offer throughout the seasons. All dietary requirements can be catered for but must be advised at the time of booking. Please note some catering requirements may attract a surcharge – please enquire. 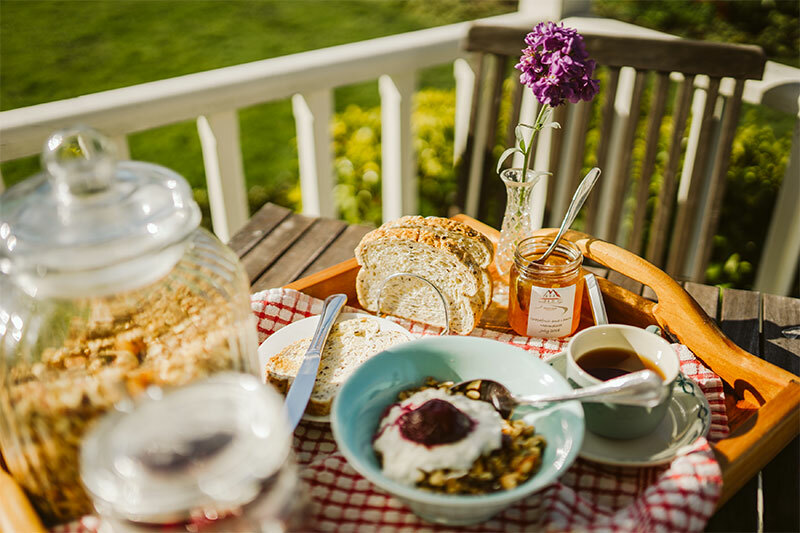 Enjoy a delicious breakfast spread including a range of cereals (including our own home-made muesli), yoghurt, fresh and preserved fruit, milk, eggs, bread and an array of spreads including our own jams and jellies made with fruit from our orchard. Best enjoyed in the morning sun on the veranda overlooking the flowering perennial garden with a steaming hot cup of freshly brewed coffee or tea. Freshly made light fluffy scones with butter, a selection of homemade jams and jellies and, of course, lashing of cream. All served with plunger coffee, tea or herbal tea. Heading out and about, or taking advantage of our farm walkway? We can provide you with a packed lunch consisting of a delicious country-style sandwich, a piece of home baking, fresh fruit, water bottle and snack pack. For large groups (15 +) visiting the homestead and gardens a plated lunch can be provided consisting of country-style sandwiches, a savoury, piece of home- baking and fresh fruit, all served with tea or plunger coffee. Perfect for corporate retreats and team-building days, our work-day lunches are supplied ready-to-eat at a time specified by you. We focus on light and nutritious brain-food to help you get the most out of your work-day retreat. We can supply a lunch spread of finger food for your gathering consisting of a variety of savoury and sweet finger foods for you and your guests to enjoy. Example foods include mini-bagels w. salmon and herbed cream cheese; roast tomato tartlets; club sandwiches; lemon tartlets; chocolate bliss balls; fruit platter. Perfect for your arrival night when all you want to do is explore and relax and not worry about cooking. We will have your evening meal ready and waiting for you – all you’ll need to do is finish it off perhaps by cooking some meat on the BBQ or popping something in the oven when you are ready to eat. All followed by a delicious sweet treat to finish off the meal. Crusty fresh bread w. hummus. Followed by tangy lemon tart served with fresh berries and Greek yoghurt. A delicious family-style meal, delivered to the house at a time specified by you and ready to tuck into and enjoy straight away. Special daily catering packages are available on request – please contact us for prices and more information.